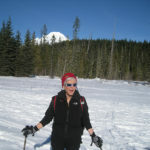 Posted December 24, 2012 by Heather Michet & filed under Exercise, Health Tips. Get moving outside! Walk, hike, ski, board, snowshoe, run…and take in your daily dose of Vitamins G and N. Hunh? Be outside on the Ground and in Nature. We need the restorative power of nature more than ever before as we create greater connections (handcuffs?) to technology and spend less time outside. Why should we do this now, it’s winter and the holidays? Stress is reduced. A study at the University of Washington shows that the real thing, e.g. taking a hike, is more powerful and effective in reducing stress than a technical replacement such as watching ‘Animal Planet’. When we reduce our stress levels, immunity is boosted. Perhaps you can ward off the holiday ‘cold’ or flu by doing this practice. Creativity and clear thinking are increased when we take a break from the tech toys and lower stress by being active outside. Our mood and self-esteem are elevated; we just plain feel better when outside and afterwards. That stroll with Aunt Martha, your dog or by yourself could be a great antidote to the holiday blues. “We need the tonic of wilderness.” said Henry David Thoreau. So go get wild – even if it’s walking around the neighborhood. Get well and stay well through your outdoor wildness.